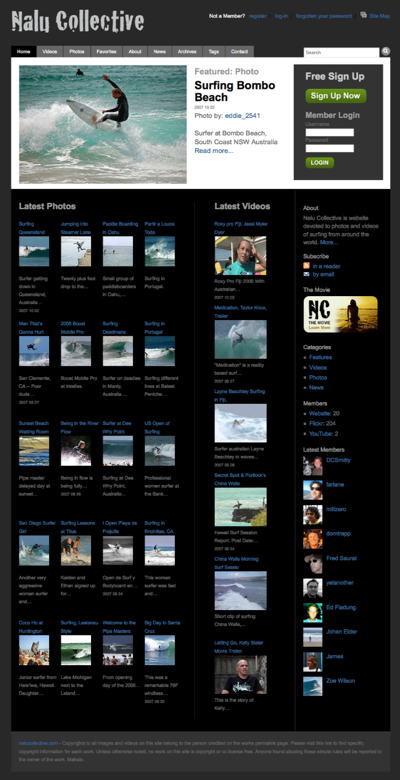 Nalu Collective is a website and community devoted to the art of surfing from around the world, including photos, videos, and features. In addition to bringing together the best surf content, Nalu Collective provides a places for surfing enthusiasts to get together online. We designed and developed Nalu Collective, a website and community devoted to the art of surfing from around the world, including photos, videos, and features. In addition to bringing together the best surf content, Nalu Collective provides a places for surfing enthusiasts to get together online. Nalu Collective is a user generated website with a twist, accepting content from anyone in their public groups (e.g. fickr, youtube and blip), however, group submissions will only be viewable at the source. Nalu Collective editorializes submissions and only presents the best of the group’s content on the website. Membership is open to the public, especially surfers, photographers, videographers, and fans. Design consulting, concept design, UI, UX, development.